LT1000 Amplifier –The Patented leak detection amplifier, designed by LeakTronics to power all LeakTronics electrical components. The Pool Scope: Highly Sensitive for listening throughout the entire pool shell. The Pipe Mic: used to find leaks in pipes, main drains, return lines, skimmer lines, and more. Water Resistant Flashlight – for looking in skimmer (seams) and light niches. Inspection Mirror – for hard to see places. 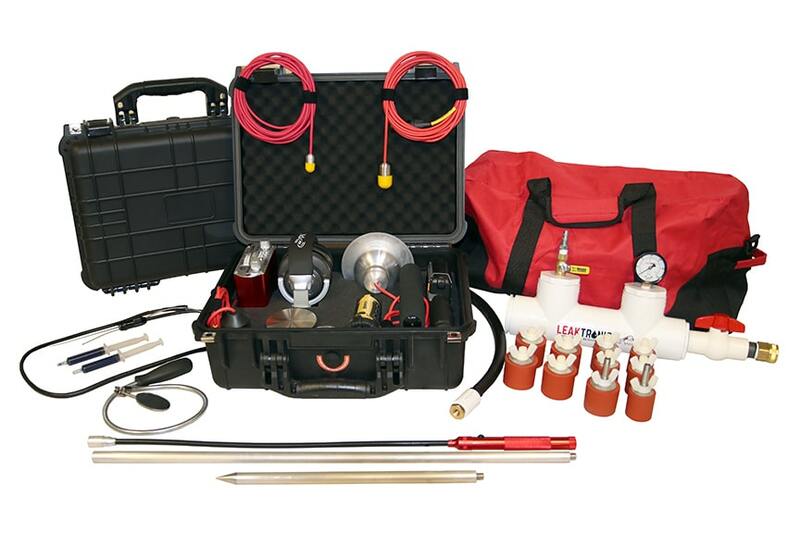 The Pro Kit is the perfect entrance to leak detection. With the power of our LT1000 Amplifier, the Pool Scope and the Pipe Mic – listening for leaks has never been easier. Just put the mic in the pool, spa or body of water where the leak occurs. The weight of the water pushing down on the leak will cause a sound that you’ll hear using the Pool Scope. Drag the Pool Scope over main drains, listen in skimmers, at lights, side ports, return fittings, along structural cracks, step tracks, vinyl seams – anywhere that a leak might occur. While 95% of leaks are found within a three foot radius of the pool shell, you’ll listen inside return fitting lines, spa jets and lines running out from the pool using the Pipe Mic. Listen down inside skimmer pipes to hear just where the leak is and get inside lines as small as 1 inch to accurately isolate a leak. With the Pro Kit, you’ll be able to upgrade with any LeakTronics equipment as they all plug in to the LT1000 Amplifier for listening. 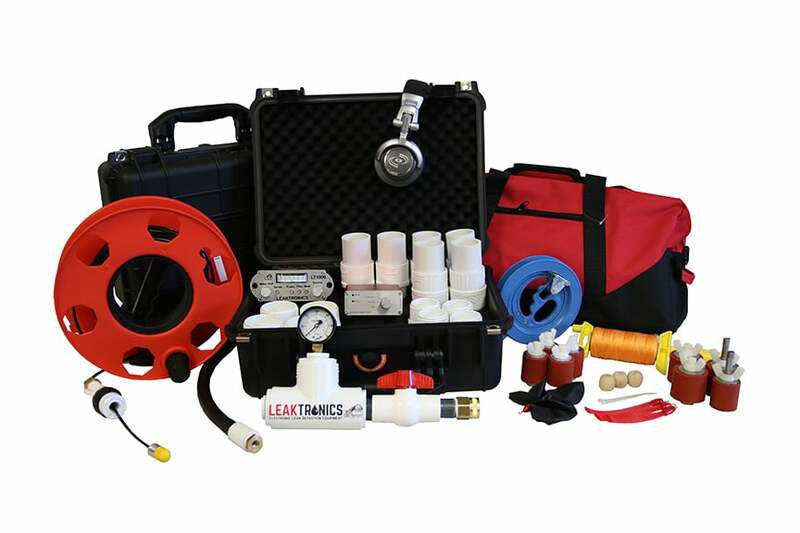 You can purchase upgrades as you need them, while having the ability to detect leaks just using the Pro Kit and it’s equipment. The Deckplate – The Improved LeakTronics Deck Plate (TM) with advanced noise filtering technology makes listening through concrete, brick, rock or any other solid surface simple. Video Scope with Dye Injection (***DO NOT LEAVE IN DIRECT SUNLIGHT). Pressure Rig with Controllable Air & Water Valves. 1.5 inch and 2 inch Injection Plugs (one of each). 1.5 inch and 2 inch Compression Plugs (four of each). 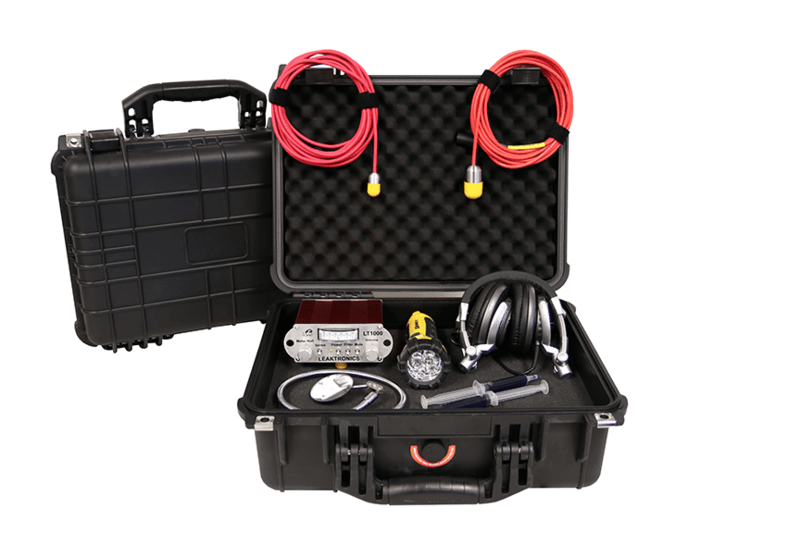 The Pro Complete offers everything a pool pro needs for leak detection. Whether listening from inside of the pool, in plumbing or under the deck, grass, soil or aggregate – even looking inside the pipes: The Pro Complete has you covered. Packing the same power as the Pro Kit with both the Pool Scope and the Pipe Mic, the Pro Complete adds the versatility fo the multi-purpose listening probe for hearing pipes under grass and soil and beneath loose aggregate like landscaping gravel. The sensitivity of the probe’s tip is as powerful as any of our mics and you can shorten the probe for easy listening on pipes and plumbing that runs behind other water and landscape features. Use the Pressure Rig and the included plugs to test lines and you can listen to leaks beneath concrete at more than 60 inches of depth by using the Deck Plate. Get a look inside skimmer lines and behind fittings with the small video-scope that includes dye-testing capability. 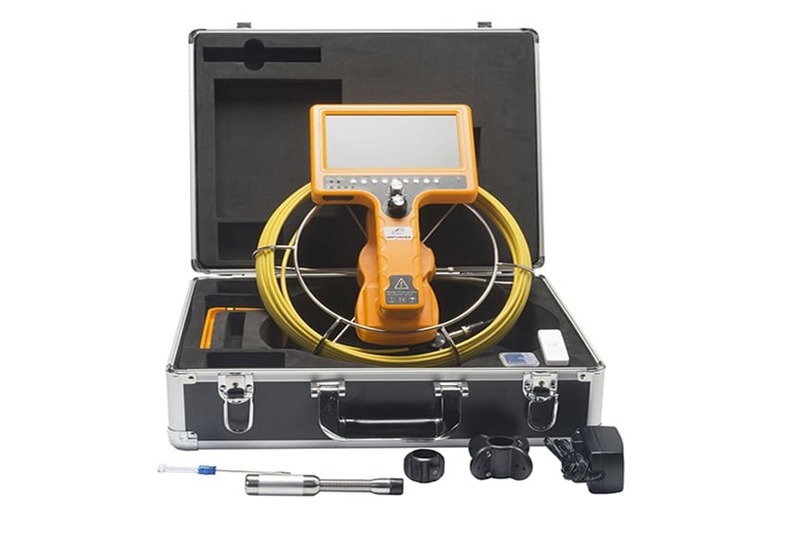 The Pro Complete is the perfect kit for those looking into taking leak detection jobs on a regular basis, for home inspectors that want to completely inspect pools by providing proper leak detections, or for pool and spa professionals that simply don’t want to outsource leak detection to another company. 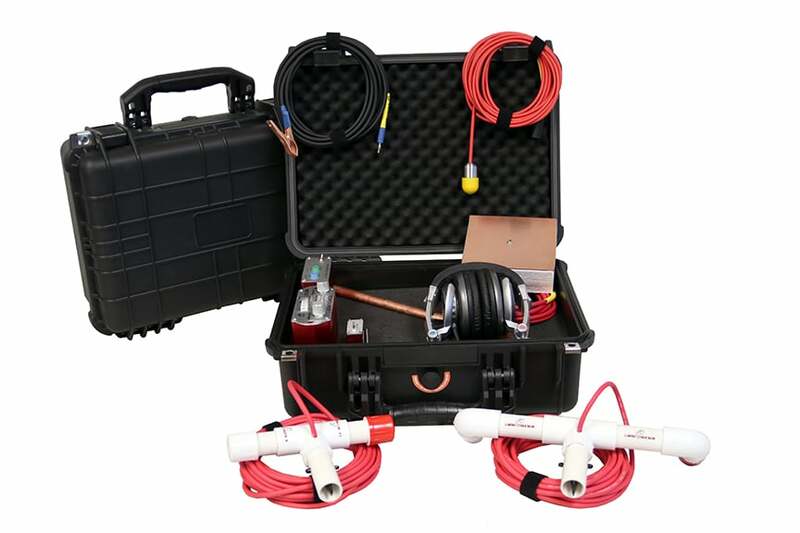 We take leak detection into the Vinyl Liner Pool market with the VILO Vinyl Liner leak detection kit. Using our standard wall probe and our unique floor probe, designed to listen to just the pools floor surface while avoiding sound from other potential positive sources of electrical signal – the VILO will listen throughout the entire vinyl liner surface. Start your leak detection using the included Pool Scope and listen at main drains and return fittings, in the skimmer and at any seams in the liner. Use the powerful VILO Receiver in conjunction with the VILO Transmitter and Float to listen for the transmitter’s square voltage signal as it finds ground at any tears or holes in the liner. When combined with the Pro Complete – leak detection technicians have the equipment to find leaks in any pool at any time. 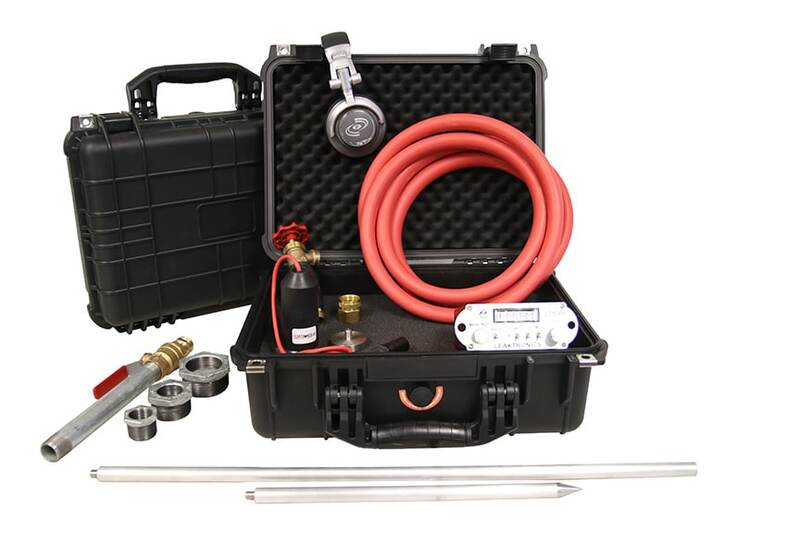 The VILO Add-on is the perfect leak detection kit for the vinyl liner market and solves the problems leak detection technicians have found with other kits that are sold in the marketplace. 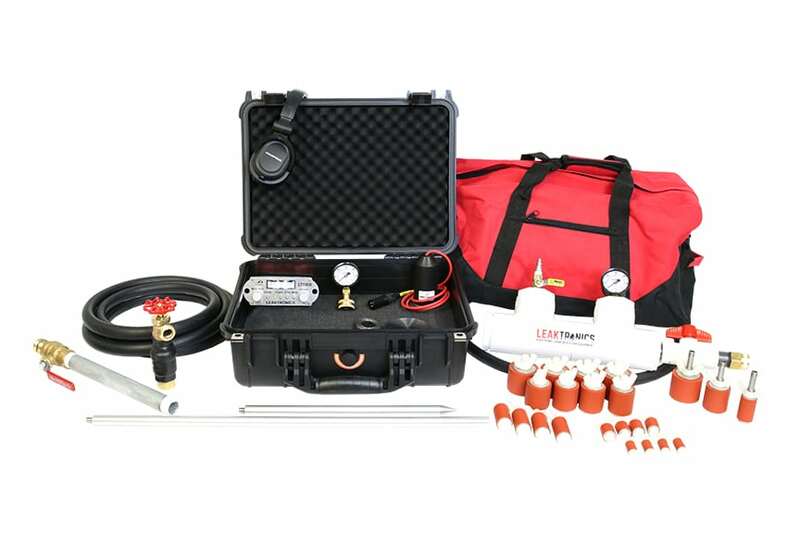 Bring Vinyl Liner Leak Detecting ability to your Pro Complete or Pro Kit by adding on just the vinyl listening equipment that works with your current LT1000 and headphones already in your current kit.